Real democracy and the Internet are not mutually exclusive. Here, for the first time in one volume, are some of the most cogent thinkers and doers on the subject of the cooptation of the Internet, and how we can resist and reverse the process. The activists who have put together Ours to Hack and to Own argue for a new kind of online economy: platform cooperativism, which combines the rich heritage of cooperatives with the promise of 21st-century technologies, free from monopoly, exploitation, and surveillance. Nathan Schneider is a Scholar-in-Residence of media studies at the University of Colorado, Boulder. He has written for Harper’s, The Nation, The New York Times, The Catholic Worker, and other publications. His most recent book is Thank You, Anarchy: Notes from the Occupy Apocalypse. This is a guidebook for a fairer kind of Internet. While we intend to foster something new in the online economy, we do so by turning to something old: the long tradition of cooperative enterprise. The problems of labor abuse and surveillance that have arisen with the “sharing economy,” also, are not entirely new; they have much in common with struggles on nineteenth-century factory floors. By considering the emerging platforms in light of well-hewn cooperative principles and practices, we find an optimistic vision for the future of work and life. Already, this strategy is catching on. Workers, organizers, developers, and social entrepreneurs around the world are experimenting with cooperative platforms and forming conversations about platform cooperativism. This book, therefore, is an effort to serve a movement in the making, to add to the momentum we and our fellow contributors already feel. We each came to platform cooperativism by somewhat separate paths. Trebor had been convening the Digital Labor conferences at The New School since 2009, from which arose an earlier book, The Internet as Playground and Factory. In publications like The Nation and Vice, Nathan was reporting on the protest movements of 2011 and efforts among young people to create ethical livelihoods, online and off, once the protests receded. We met at OuiShareFest in Paris in 2014, and, at Trebor’s “Sweatshops, Picket Lines, and Barricades” conference later the same year, we both sensed it was time to think about constructive alternatives to the dominant Silicon Valley model. 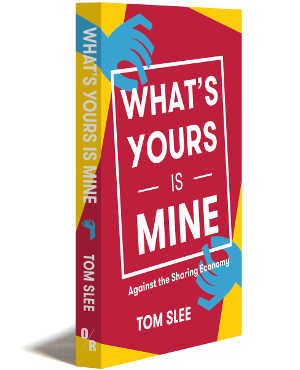 That December, Trebor published “Platform Cooperativism vs. the Sharing Economy,” framing the concept that would come to be this movement’s moniker. The same month, Shareable published Nathan’s article “Owning is the New Sharing,” which mapped out some of the efforts to build cooperative platforms already underway. Realizing our common interest, we discussed these ideas with interested platform-workers, labor advocates, techies, and luddites—many of whom, we found, were venturing into various forms of platform cooperativism already. We agreed it was time that they should meet each other. In November 2015, we held a two-day event called “Platform Cooperativism: The Internet, Ownership, Democracy” at The New School. More than a thousand people came, including New York City Council members, CEOs, investors, platform creators, and leading scholars. The Washington Post deemed the event “a huge success.” Shortly after, the Rosa Luxemburg Foundation published Trebor’s primer on platform cooperativism, which has been translated into at least seven languages. Follow-up events have taken place in Barcelona, Berlin, Bologna, Boulder, London, Melbourne, Paris, Rome, Milan, Vancouver, and elsewhere. Before we get started, let’s make sure we are talking about the same thing: shared governance and shared ownership of the Internet’s levers of power—its platforms and protocols. Democratic ownership and governance are the pillars of what cooperativism refers to, both here and historically; without these, the word rings hollow. Second, this book calls for a process, not another trick of technological solutionism. Platform cooperativism will not come about simply through a few killer apps; it will require a different kind of ecosystem—with appropriate forms of finance, law, policy, and culture—to support the development of democratic online enterprises. This means challenging the cooperative movement to meet the opportunities of the platform economy, and challenging the platform economy to overcome its obsession with short-term profits for the few. Platform cooperativism is a radical horizon, to be sure, but we should not regard it as an absolute. There will be multiple and sometimes partial means of getting there. A company that shares some ownership and governance is better than one that shares none, and we celebrate that. We encourage a variety of strategies and experiments. Throughout this process, we have been amazed by the enthusiasm and experience that so many people around the world have brought to the #platformcoop conversation, and the effort to make it a reality. We hope this book does justice to the power of what is already underway, as well as the hurdles we still face together. We dedicate the book to those with the courage and imagination to create an Internet worthy of the people it connects.